The umbrella-like antenna on the U.S. Navy's experimental TacSat 4 communications satellite has popped open and begun relaying voice messages a week after launching from southern Alaska, according to mission officials. The 12-foot-diameter antenna opened three days after the craft's Sept. 27 launch aboard a Minotaur 4 rocket from Kodiak Launch Complex in Alaska. TacSat 4 was developed by the Naval Research Laboratory, marking that organizations 100th satellite since the dawn of the space age. Its objective is to demonstrate advanced communications capabilities for U.S. forces deployed in war zones like Afghanistan. Mike Hurley, the lab's head of spacecraft development, said the TacSat 4 "antenna has deployed and is working well," adding the satellite has already started processing voice data to and from user radios on the ground. Designed and built in-house by the Navy Research Laboratory for approximately $2 million, the 60-pound antenna was folded up like an umbrella for launch. A strap connected with a breakable joint held the antenna in the launch position until the command was issued to deploy, then 20 springs pushed out the antenna in a few seconds. Commercial satellite antenna-builders have approached the Navy for details on the TacSat 4 design, according to Hurley. 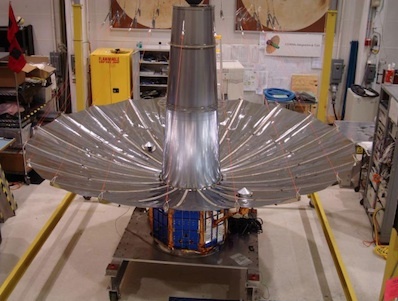 Many satellite antennas are much more costly, and industrial proposals to build TacSat 4's antenna were too expensive for the mission's limited budget. TacSat 4's payload includes 10 UHF communications channels. According to military officials, UHF communications make up for a lack of bandwidth with high reliability. From its unique orbit between 465 miles and 7,457 miles above Earth, TacSat 4's communications signals can reach existing handheld radios with deployed military units. Legacy military communications satellites are stationed three times further from Earth, meaning its signals aren't as strong and troops need a larger radio to transmit and receive messages. Although TacSat 4 can only cover part of the Earth at one time, a fleet of four or five similar satellites could provide global coverage and facilitate "communications on the move" for U.S. forces. Military personnel now must stop and point a large antenna toward a satellite to receive communications. "TacSat-4 supports a critical warfighting requirement: communication," said Rear Adm. Nevin Carr, the chief of naval research. "We've developed a technology that will supplement traditional satellites, giving military personnel on the ground another outlet for data transmission and facilitating 'comms on the move.'" Hurley said testing of the TacSat 4 spacecraft should be complete next week, and there's another four-to-five weeks of testing of ground terminals and user equipment before the real mission begins. The $118 million TacSat 4 mission is designed for a one-year test campaign to show the utility of the added UHF communications capacity, then the satellite could be transitioned to normal military operations. TacSat 4 is part of the Defense Department's Operationally Responsive Space office, which was established to develop niche satellites with less funding than traditional military programs.